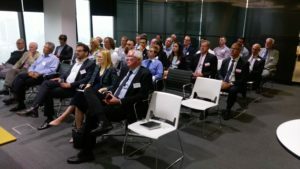 The Queensland Branch celebrated IMO 70 Our Heritage – Better Shipping for a Better Future, World Maritime Day with a well-attended and successful seminar on 11 October 2018. The Chair, Captain Burton welcomed members and guests and introduced the World Maritime Day 2018 message from IMO Secretary General Kitack Kim. The Branch was extremely fortunate to have Senator Amanda Stoker as our key speaker, followed by Captain Steve Pelecanos, Mr Andrew McClymont and Captain Michael Kelly. 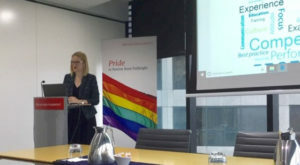 Senator Amanda Stoker spoke about Australia’s early navigation heritage and the indispensible role the shipping industry has played in our Nation’s development and prosperity. The Senator was concerned about the decline in Australia’s coastal trade and saw strategic value in the Australian private sector having a key role in focussing on and improving Australian shipping in the future. She is determined to ensure real employment opportunities for Australians competing in a fiercely global environment. In closing the Senator said that, in keeping with this year’s theme, it was imperative that we have strong advocates both in industry and in Parliament to work together towards a better future. The Senator offered to listen to the concerns of the industry and offered her voice for the interest of the industry as well as dialogue in the long term about how to make better shipping in Australia work for long-term global trade. 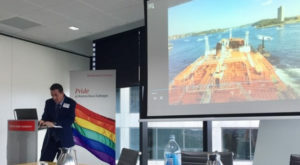 Captain Steve Pelecanos, a longstanding Nautical Institute Fellow and a prominent and easily recognisable name in Australian shipping, gave a presentation about his experiences in trying to establish an Australian owned coastal shipping company, Hermes Maritime. Steve briefly described the difficult challenges he and his business partner have had from concept, feasibility, and business plan stages, to get to their current implementation stage. He presented statistics to support coastal shipping both in economic and environmental terms. A single voyage on their nominated ship can replace 596 B-double trucks, 810 semitrailers, and 10 intermodal freight trains. The benefits to governments and the community are – reduction of traffic on already congested roads, fewer traumas from vehicle accidents, savings on high costs of repairs and upgrade of roads and being able to provide a continual service when roads and rail are affected by natural disasters. From an environmental perspective, a ship will only emit 12g CO2e t/km as compared to 180g CO2e t/km by a single truck. Steve is very optimistic that their first weekly service between Brisbane and Townsville will commence in early 2019. Andrew McClymont is a Nautical Institute member and is currently employed as a navigation officer with Toll ANL Bass Strait Shipping. Andrew briefly described the history of the important and vital trade previously operated by Brambles. Currently, Toll operates two ro-ro ships between the Melbourne in mainland Australia and Burnie in Tasmania. Each ship provides an overnight service carrying a range of cargo, which includes 324 TEUs, refrigerated perishables, livestock, minerals, loaded semitrailers, new vehicles and dangerous goods. The short voyage through the Bass Strait can at times be very treacherous and the company has adopted new technology to secure the cargo efficiently and swiftly. Due to increasing cargo demands, Toll has invested $311 million to build two purpose-built ro-ro ships and to upgrade their two terminals at either end. The company has been very proactive in relation to new emission standards by factoring in their new ships, slow speed engines that are capable of using low sulphur heavy fuels and diesel and retrofitting them for the use of gas in the future. Our final speaker, Captain Michael Kelly, is currently a Marine Pilot with the Port Authority of New South Wales in the port of Sydney. Michael is a great advocate for promoting Australian shipping for Australians. He is deeply concerned that Australia, as a continent surrounded by oceans and seas, has only 11 Australian registered ships. In comparison, Michael says that in 1991 when he joined the industry there were 130 Australian registered ships operated and managed by Australians. Over the last few years Michael has lobbied many members of Parliament including The Honourable, The Prime Minister Mr Scott Morrison when he was Treasurer. The industrial disruptions by militant waterfront unions of yesteryear is embedded in people’s minds and Michael is desperate to change this. As with the other speakers before him, Michael is keen to promote the importance of shipping by Australians for Australians. He sees the employment and training of young Australians as a start that can build on a better future. Michael, with the support of the Port Authority of New South Wales, has recently been successful in sponsoring the cadetship of two young Australians. He hopes that this effort will be followed by other organisations because it is important to groom of young Australians who will in the future become successful marine pilots, harbour masters and maritime experts who are acknowledged globally. A special thanks was extended to all speakers and to Norton Rose Fulbright for their continued assistance and support.